These Paleo lemon bars are so good! They have just the right amount of lemon filling and crust and are my all-time favorite dessert! They have a small amount of honey and that is the only sweetener. This is a great sugar alternative for when you have a craving for something sweet but want to still eat healthily. The best part is no one will ever be able to tell that these delicious bars have no refined sugar in them because they still have a yummy sweetness to them. These lemon bars have a nutty, shortbread-like crust that is not crumbly at all! The topping is a creamy, super-tangy lemon curd that has a little bit of coconut milk added to it to make it extra luscious. I spent a lot of time developing a recipe that has a thick lemon filling that doesn’t absorb into the crust and a crust that actually holds together and doesn’t crumble all over the place. My favorite part of lemon bars is the filling and I wanted to make sure there was plenty of that. I especially don’t like it when it absorbs too much into the crust. I hope you too love this recipe as much as I do. My 4-year-old daughter is a bit of a sugar fanatic (it’s a problem) and she was obsessed with these bars when I first made them! She begged me for them constantly – though she didn’t realize that there is only about 1/2 tablespoon of honey in each bar. I felt pretty good about giving her these bars as a much healthier alternative to regular lemon bars that are full of sugar. I actually made this Paleo lemon bars recipe for Thanksgiving dessert last year. Usually, I just don’t eat dessert at Thanksgiving, but sometimes I just feel left out and get tired of everyone asking me what dessert I want. So I made these because lemon bars are my absolute favorite dessert of all time. I love how they are tangy. I won’t lie and say my dad even tried these, but I enjoyed them and ate them for several days after, even after they got soggy in the fridge. The flavor was still there. Now I’m planning to make them for a family BBQ we have coming up. 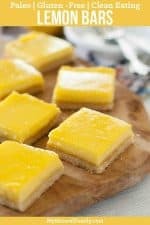 I would love to know what occasion you make these Paleo lemon bars for and who you could get to eat them. Please comment below. 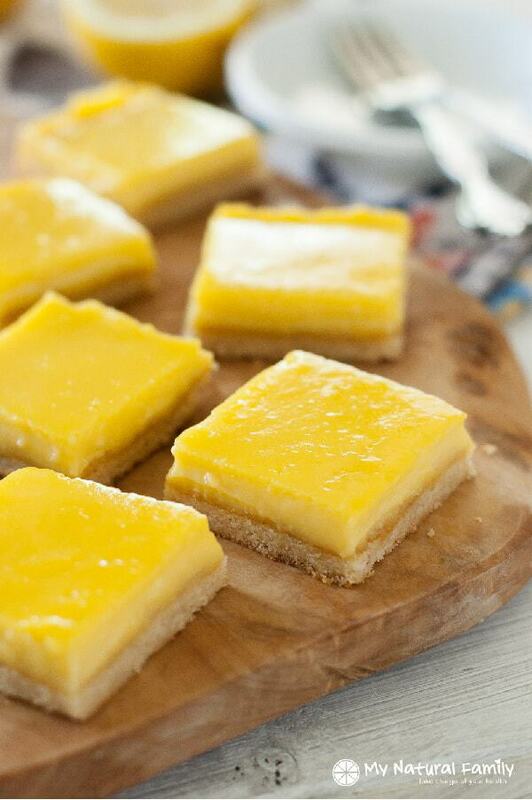 These lemon bars have a nutty, shortbread-like crust that is not crumbly at all! 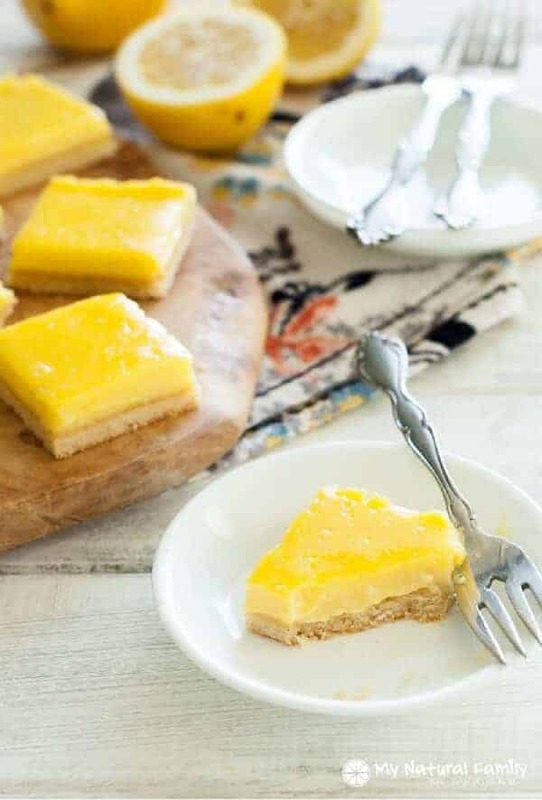 The topping is a creamy, super tangy lemon curd that has a little bit of coconut milk added to it to make it extra luscious. My 4 year old is a bit of a sugar fanatic(it’s a problem) and he was obsessed with these bars! He begged me for them constantly though he didn’t realize that there is only about 1/2 tablespoon of honey in each bar. I felt pretty good about giving him these bars as a much healthier alternative. My husband and I could not get enough of these, either. Preheat the oven to 350 degrees. Line a 9×9″ baking pan with parchment paper so that the paper goes all the way up the sides of the pan. In the bowl of a food processor, pulse together the almond flour, tapioca starch, and salt. Add the honey and cubes of butter and process until smooth dough forms. Press the dough evenly into a 9×9″ baking pan lined with parchment paper. Bake the crust for 10 minutes in the preheated oven, or just until it starts to turn golden brown on top. While the crust is baking, make the filling. In a large saucepan, whisk together the eggs, honey, lemon juice, and salt until very smooth. Place the pan on medium/high heat and add in the butter cubes. Whisk constantly until the butter melts and the mixture comes to a boil. As soon as the mixture boils, remove it from the heat. Whisk in the coconut milk and pour the filling on top of the par-baked crust. Return it to the oven and bake for another 10 minutes, or until the filling is glossy and set. Let cool completely. Refrigerate for a few hours and slice into bars with a hot knife. Keep bars refrigerated in an airtight container. How are these paleo with all that butter? I personally feel that butter is Paleo, so I include it in my recipes. If you don’t want to use it, you are welcome to sub in your favorite Paleo fat, such as coconut butter or ghee. However, it won’t taste quite the same. Hi, In the recipe for Lemon Bars, the ingredients list Tapioca Flour, but the directions say Tapioca starch. Are they one in the same? Also, what is the difference in coconut milk in the carton and in the can? Thank you. I’m looking forward to trying them. Tapioca flour and starch are the same thing. I’m not sure about coconut milk in a carton, because they don’t have that at any stores I shop in. I would cause that the stuff in the can has a lot more fat, because it’s really thick and has a high fat content. Hello, can this recipe be doubled to fit in to an 9×13 pan maybe? if not i only own an 8×8 pan so will that work??? Thanks so much, cant wait to try many of your recipes…. I believe other commenters have said it works fine in an 8×8 pan. Just made these for my boyfriend Who now has to medically be gluten free. He absolutely loves lemon bars, and he was asking me for the recipe by the end of the night. They were SO good. And I’m not a fruit dessert gal- everything came out perfectly. I had it set overnight and it was fine. I topped with a little powdered sugar (gluten free) for looks. Also I only had an 8×8 glassware, and it was the perfect size in my opinion. 9×9 might be spreading it too thin. So good to hear! Lemon bars are totally my weakness and I’m sure the other readers will appreciate your comment with your suggestions. I can’t have coconut milk. 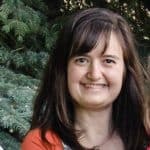 What would make a good substitute? Would almond milk work? That is a good substitute question, if you give it a try let me know. I have never tried it myself. I’ve never heard of tapioca starch here in the UK and wonder if you can advise on a substitute please.. Also any idea of the nutritional values please? Arrowroot starch can be used in place of tapioca starch. You can find the nutritional value on our recipe here: http://myrecipemagic.com/recipe/recipedetail/lemon-bars-recipe Make sure you go to the Nutrition tab instead of the recipe one. Thank you so much for the reply. First time I have managed to get onto your site for ages.. don’t know what my problem is… I found the nutritional values and will be making these for my extended family this weekend by which time I will have tracked down the arrowroot. how can this be labelled Dairy Free with butter in both the crust and the topping? Is there anything we can use to replace the butter? Coconut oil works extremely well in place of butter. I made this recipe over the weekend. It is fabulous!!! !